Light Nightclub Las Vegas is a night club in Vegas at the Mandalay Bay Hotel and Casino that opened April 23rd 2013, and celebrated its grand opening Friday May 24th 2013 over Memorial Day weekend. Formally known as Rum Jungle, this $25 million dollar venue packs out at 38,000 square feet, contains one of the largest dance floors in Las Vegas that is 840 square feet, and has a 35 foot high ceiling. The capacity is approximately 2,250 people, with a sitting capacity of 1850, and a standing capacity of 400. There are a total of 95 VIP table locations on 2 levels of this club including the Club Level, which has 68 VIP table locations, and the Mezzanine Balcony Level, which has 27 VIP table locations. Light Nightclub Las Vegas was once a night club in Vegas called “Light Club” which opened December 20, 2001 at the Bellagio Hotel and Casino during New Year weekend then closed their doors 6 year later in 2007. 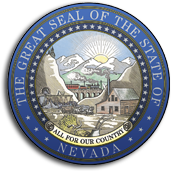 The brand name was developed by The Light Group of Las Vegas NV that sold the company to the Hakkasan Group in December 2014 for $35 million dollars. This venue is easily one of the top 7 nightlife destinations in Las Vegas in 2016, and made the Best of Vegas top 10 list in 2014. 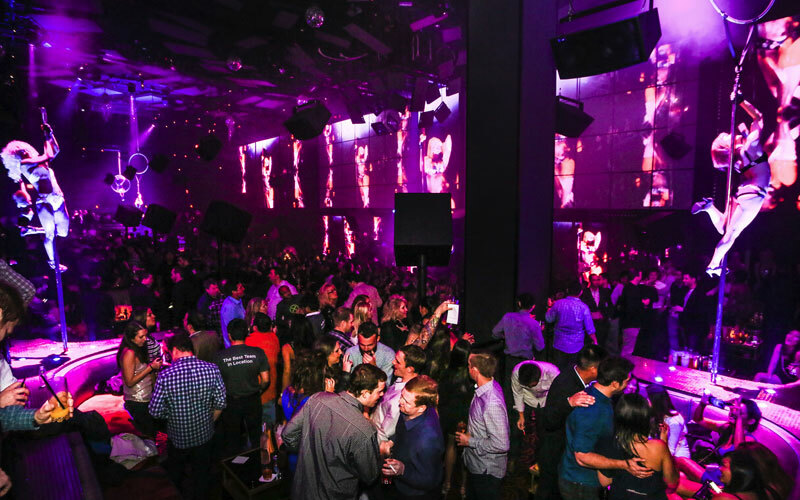 Light Nightclub Las Vegas is a Sensational night club in Vegas that was a business collaboration of the Light Group and Cirque du Soleil that would provide unmatched performance talent unlike any other venue. The design was crafted to captivate the attention of the human senses by providing state of the art lighting, audio, video, special effects, and additional visual elements by Cirque Du Soleil dance performers, and acrobats who deliver different choreographed performances each night. Without a doubt this venue provides some the most talented and skilled performers in the world. When is Light Nightclub Las Vegas open? Operational hours at this night club in Vegas are Wednesday, Friday, and Saturday from 10:30PM to 4:00AM. Peak hours of operation are between 12:00AM and 1:00AM. Industry nights are on Wednesday. It’s hard to say which night is the best because it’s a different experience every time. Where is Light Nightclub Las Vegas located? The location of this night club in Vegas is in the Mandalay Bay Hotel and Casino in between the Mandalay Bay Valet Drop Of area, Race and Sports Book, and Red Square Russian Restaurant. When you arrive at the property you will want to park in the self-parking garage or get dropped off the Casino entrance located in between the parking garage elevators and Mandalay Bay Valet Drop Off area. As soon as you enter you will see the club to your left. You can also get to the club through the valet entrance at theHotel at Mandalay where it will appear to your left. It’s best to get there by taking Hacienda Avenue to theHotel, or Frank Sinatra Boulevard to the Mandalay Bay parking garage. As soon as you arrive you will notice the glow of the illuminating letters that spell out “LIGHT” in the arched doorway entrance. How much is the cover charge at Light Nightclub Las Vegas? Cover charge at this night club in Vegas is $20 to $30 ladies and $30 to $40 for men. This is an average estimated price for admission but you can expect the price to increase when they bring in top tier DJs or during holiday weekends when they know they are going to sell out anyways. How long do I have to wait in line at Light Nightclub Las Vegas? Line waiting times at this night club in Vegas take approximately 25 minutes to 1 hour on Friday and Saturday nights. The line tends to move a lot faster on Wednesdays, but it all really depends on the performing DJ that DJ. When they bring in top tier DJs or during holiday weekends, you can expect the maximum waiting time. It all really depends on the line you are standing in. he general admission line is going to be a lot slower than the guest list line or presale ticket line. The fastest line by far is the line for bottle service reservations. What is the dress code at Light Nightclub Las Vegas? Dress code at this night club in Vegas is strict dress just like all the other top venues do. You should dress in nice jeans, sports coat, dress pants, nice shoes, collared shirt, shirts tucked, and have you shoe laces tied. It’s a buzz kill for everyone in your group when you have to be the one who gets turned down at the door. Make sure you do not wear sportswear, tennis shoes, sandals, jerseys, wife beaters, saggy baggy, or ripped clothing. Do not wear hats or sunglasses in the nightclubs either or you risk being thrown out once you are inside. Respect the luxury entertainment this venue provides by dressing to impress those around you. Make sure you have no contraband on you because you will most likely be asked to empty your pockets at the door before you get in. What type of music do they play at Light Nightclub Las Vegas? Music genres at this night club in Vegas are mostly EDM, but there is a mix of Hip Hop too as well. There is a mix of electronic dance music that is played at the venue including House, Trance, Drum n Bass, Dub Step, and Techo. Remember that each night is different than the last, so you need to take a look at the calendar for our list of upcoming events so you know what you are getting yourself into. Who are the resident DJs at Light Nightclub Las Vegas? Resident DJs at this night club in Vegas resident in 2016 include Baauer, DJ Five, DJ Mustard, Eric Dlux, Jayceeoh, J. Cole, Laidback Luke, E-Rock, Metro Boomin, Morgan Page, Post Malone, and Stafford Brothers, and T-Pain. The 2015 resident DJ lineup included Alesso, A-Trak, Axwell, Baauer, Bassjackers, Carl Cox, Clockwork, Disclosure, Dyro, GTA, Hook N Sling, Macklemore & Ryan Lewis, Morgan Page, Sebastian Ingrosso, Silver, and Sultan & Ned Shepard. Other past DJ performances and residents include Dirty South, Krewella, FatBoy Slim, Henrix, Nicky Romero, Norman Doray, Skrillex, Stellar, Steve Powers, Thomas Gold, will.i.am, and Zedd. How much money does Light Nightclub Las Vegas make? 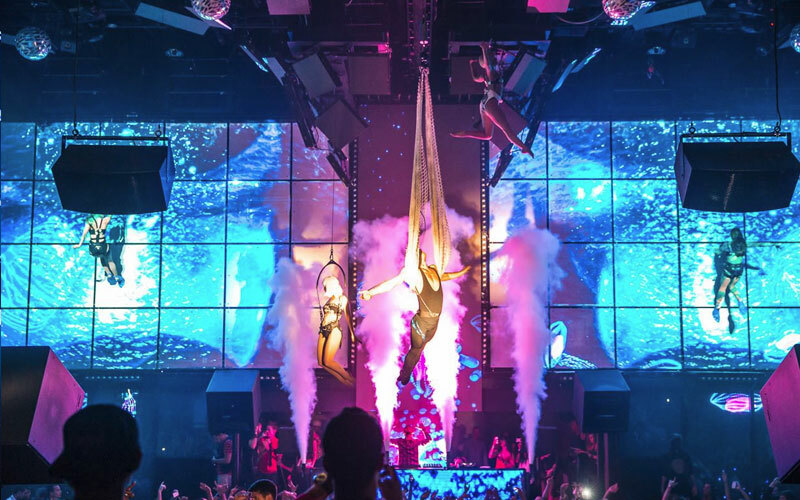 Revenue generated at this night club in Vegas earned honorable mention in the 2014 Nightclub & Bar Top 100 list generating between $20 and $25 million dollars its first year in business. In 2015 the club was not listed in the top 100 list but it’s estimated to have generated between $35 to $40 million dollars. Are there Circus de Soleil performers at Light Nightclub Las Vegas? Circus de Soleil performers at this night club in Vegas do perform. There is a partnership with Circus de Soleil and the Light Group that features some of the the best dancers and acrobats in the world. This is the first time a Las Vegas show has joined forces with a nightclub in Sin City. There are more than 20 dance performers and acrobats that alternated every few minutes that are in choreographic sync with the DJs set performance, creating a new experience for the audience every time. The performers wear theatrical costumes and use the space in front of the acrobatic walls behind them. The acrobatic walls uses double transparent see through plexi-glass layers filled with smoke to create the effects Light is then projected, and the shadows of the performers are become revealed in the smoke. The acrobats can sprint up and down the walls during their performance to get from point A to point B, and are congruent with the visual content. What is the Club Level at Light Nightclub Las Vegas? Club level in this night club in Vegas is split into 4 sections. The dance floor, 1st tier tables, 2nd tier tables and 3rd tier tables wrap around the focal point of the DJ booth in a U shape. The 2nd and 3rd tier sections elevate 3 feet above each other giving everyone in the room a clear view of the dance floor stage, DJ booth, and Cirque Du Soleil performers. There 69 VIP table locations on the Club Level that include 9 Dance Floor tables, and 2 Back Stage tales. Everything is custom built including the upholstered banquettes, tables, and even the chandeliers. There are 2 bars on the main level that including the back main bar that has 6 wells and the side bar that has 3 well. The Club Level has lots metallic finishes that reflect the light, and the ceiling contains broken shaped glass mirrors that bounce lasers, and lights all over the room. What is the Mezzanine Balcony Level at Light Nightclub Las Vegas? The Mezzanine Balcony in this night club in Vegas has 2 tiers. The 1st tier has 25 VIP table locations that wrap around in a U shape over the balcony, and the 2nd tier has 4 VIP table locations on the left side wall that you access after walking up the steps. The Mezzanine Level Balcony offers amazing spacious views over the Club Level, and Eye to Eye level views of the catwalks. The AK-47 bar is a 47 foot long that has 5 wells, and takes up nearly half the entire back wall. Behind the AK-47 bar are both a men’s restroom with 11 stalls, and woman’s restroom with 9 stalls. You can access the Mezzanine Level Balcony from either of the 2 stairwell entrances from the Club Level. What is the Private VIP Entrance at Light Nightclub Las Vegas? The Private VIP entrance in this night club in Vegas is behind the stage and DJ booth that leads to corner style 2 VIP table locations that offer a full frontal view of the entire Club Level and Mezzanine Balcony Level. When you arrive you should wait in the line for bottle service reservations until our host escorts you to the Private VIP entrance. What type of lighting does Light Las Vegas Nightclub have? Lighting in this night club in Vegas was designed by John Lyons and Richard Warboys of John Lyons Systems out of Hollywood, California. They chose go install fixtures by Elation Professional as the preferred lighting brand of choice. The lighting design was crafted so that the Circus de Soleil performers would be accentuated their features on horizontal and vertical planes, and so that the lighting would blend in with the surface of the acrobatic walls. Light is exactly when this night club gives you! In total there are 144 Elation Professional Platinum Series lighting fixtures that have been installed in the venue. There are 48 Elation Professional Platinum Beam 5R, with frost effects extreme beam effects, and 8 facet prisms. 44 Elation Professional Platinum Spot 5R Pro fixtures are used for for increased motor speed, energy efficiency, and contain 22 gobos. 28 Elation Professional Platinum Spot 35R Pro with bi-directional animation effects, 3 facet prism, frost filter, mechanical dimming, and high speed shutters and strobes. 12 Elation Professional Platinum Spot 15R Pro fixtures for superior optics, hybrid technology, and a variety of zoom features. 12 Elation Professional Platinum Beam 15R Pro fixtures with sharp gobo projections, beam effects, as well as 8 rotating and 11 static gobos. Additional lighting includes Elation Professional Opti Tri White, with Tri White™ Technology. Elation Professional Opti Quad Par with new quad color technology. There are also Elation Professional Opti 30 UV Par 30 with 12x 1W LEDs, and lastly, Elatin Professional ELAR A2 Series Inground lights were used to illuminate the various performance locations. 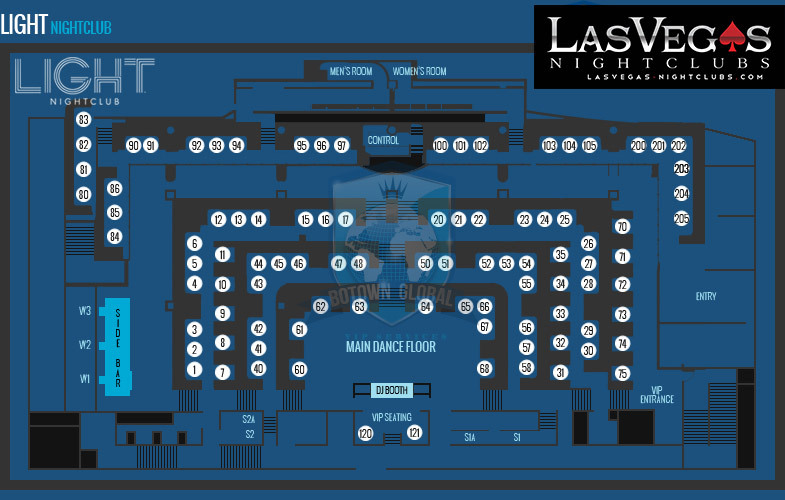 What type of audio does Light Nightclub Las Vegas have? 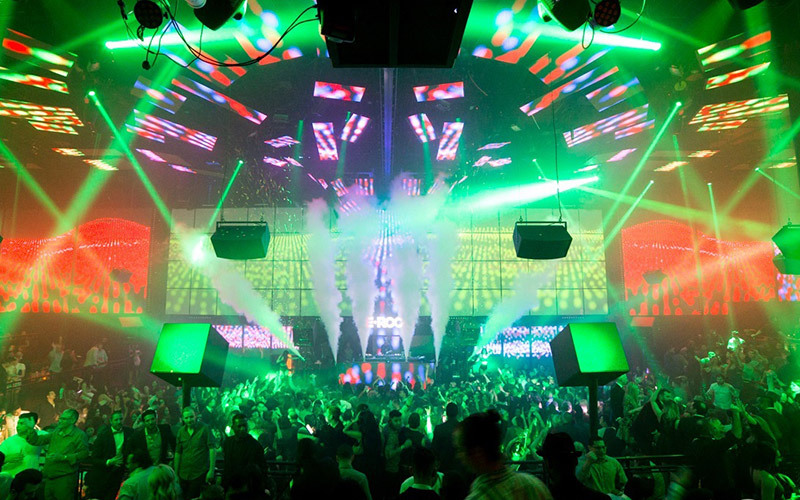 Audio at this night club in Vegas was designed by the John Lyons Systems. John Lyons chose to install Fulcrum Acoustic speakers as the preferred brand choice of audio. The idea was to have system that was compact, and to deliver heavy bass, but not disturb the visual equipment. Then venue installed Fulcrum Acoustic Prophile Series Dual 8 inch Coaxial Loudspeaker 100° x 100° for its vertical dimension and ability to be installed under ceilings, and balconies. Fulcrum Acoustic Prophile Series M Dual 12 inch Coaxial Loudspeaker 75° x 75° were installed for mid bass impact, and for wide audio coverage. Fulcrum Acoustic Prophile Series P 8 inch Coaxial Loudspeaker 100° x 100° were also installed for limited space purposes, subwoofer integration, and for high SPL. John Lyons Systems installed more than 50 Fulcrum’s Prophile S, M, & P Series loud speakers. The VIP banquets are equipped Fulcrum Acoustic US212 Dual 12 inch Direct-Radiating Subwoofers. What type of visuals does Light Nightclub Las Vegas have? Visuals in this night club in Vegas are state of the art and were designed, and installed by the John Lyons Systems. Moment Factors was hired to create rich video content that can be overlay and connect to each other. 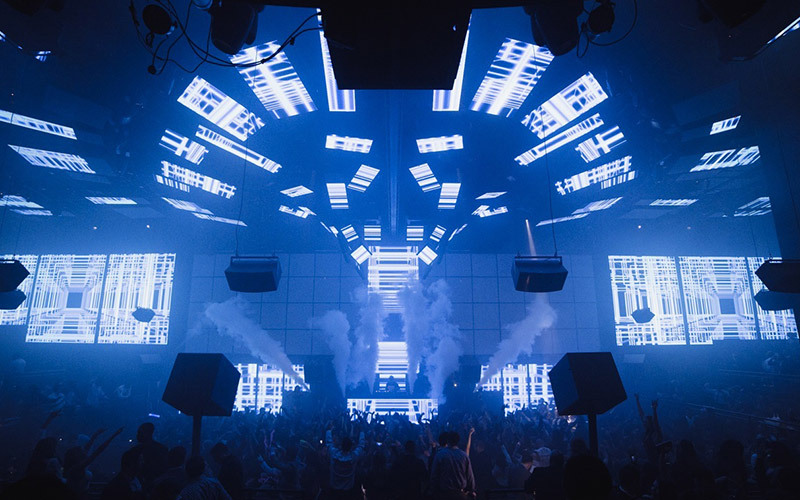 Visual production includes video mapping on 2 oversize projection walls which are also known as “acrowalls” that connect to the ceiling and hovers over the dance floor. The 2 video projectors are touch screen capable that the performers collaborate with during their performance. The visual LED screens both detect motion and body heat, and are always changing scenery. There are more than 180 degrees of video projection that are more than 2 stories high. Theatrical smoke creates a moving effect that mixes with the performers and platforms really well. There are well over 10 million pixels that have been installed in this venue. There is an LED video panel’s display that has glass framing that provides unique visuals for all of the resident DJs. Laser Sintering developed 3d printed elements by use of strobe-effect 20W High Power LEDs. The LED video panels are 6mm. LaserNet was hired to install a laser system that featured 20Watt RGB laser’s in combination with the reflecting mirrors known as bounce mirrors that would shoot beams of light in just about every direction. Who were the developers and designers of Light Nightclub Las Vegas? Development of this night club in Vegas was established by the Light Group, Cirque du Soleil, and MGM Resorts International. The artistic director included Maximiliano Torandell. Tommy Crew of the Light Group was the creative director. Guy Laliberté, founder, Cirque du Soleil had his hand involved in the development. Anouk Wipprecht of Fashion-Tech Designer was one of the Designers. Video content and special effects was done by Moment Factory. John Lyons, as well as Richard Worboys of the John Lyons Systems was the Lighting Designers, and Tom Harman of LaserNet designed the laser system. John Lyons Systems also installed the audio system. What is the levitating DJ booth at Light Nightclub Las Vegas? The levitating DJ booth in this night club in Vegas is the very first levitating DJ booth in Las Vegas that is able to rise up and down off the stage floor. The DJ booth is in the focal point of the venue located in the middle of the 2 LED screens. When DJs perform they have the capability customize visual tones in conjunction with the sound of their music. What other equipment does Light Nightclub Las Vegas use? Additional technology equipment in this night club in Vegas includes snow, smoke, and fog machines. The stage contains double winches on either side that raise the performers up and down. The Mezzanine balcony VIP tables have custom lighting and fog machines. There are PCB boards that are customized that adjoin a network adapter to a TouchOSC Beagle Board linux for design control.